While teaching my Rocks and Fossils camp this summer I found this well rounded piece of limestone. It was in a shipment of "river rock" gravel we had dumped off at the nature center to control mud in front of our sugar shack. The rocks are sorted and washed glacial till from a local gravel pit. They are a great place to look for interesting things. This rock looks pretty boring but something caught my eye. If you look closely, there are little circles on the surface of the rock. I snatched it up and put it in my pocket to take a closer look at later. My best guess is that this is a very weathered piece of fossilized coral. It looks a bit like Astrhelia palmata though lots of detail has worn away. Most of the circles lack much detail aside from their roundness. They are not uniform in size but most are approximately 2 mm across. Of the roughly 40 circles on the small rock, one has greater details than the others. Here it is magnified greatly. You can see in this shot that the circle appears to be made up of many smaller dots which seems consistent with a coral. There is a smaller, more worn circle, visible above it at the top of the image, a very worn circle on the right hand edge and a small very small circle on the bottom right. I wasn't happy with the level of detail I could get with my camera so I took a queue from the birdwatching community. Birdwatchers have pioneered the use of digiscoping wherein they hold a camera up to a spotting scope to get a zoomed in picture of birds. I wondered if I could do something similar with my 10x triplet loupe. I held the camera up to the loupe and brought it very close to the rock. It worked and I was able to get the detailed photo above. It is hard to say how old something like this is since it was essentially found in glacial till. I can fairly safely say it was transported to this part of Minnesota with the glaciers but it is certainly much older. Limestone is formed underwater as is coral. Minnesota has not been under water for millions of years. According to my sources, the most recent Minnesota was under water was during the Cretaceous period 70 to 136 million years ago. Astrhelia palmata is from the Miocene which was a much more recent period and Minnesota was not under water at the time so I am guessing that is not the correct identification. 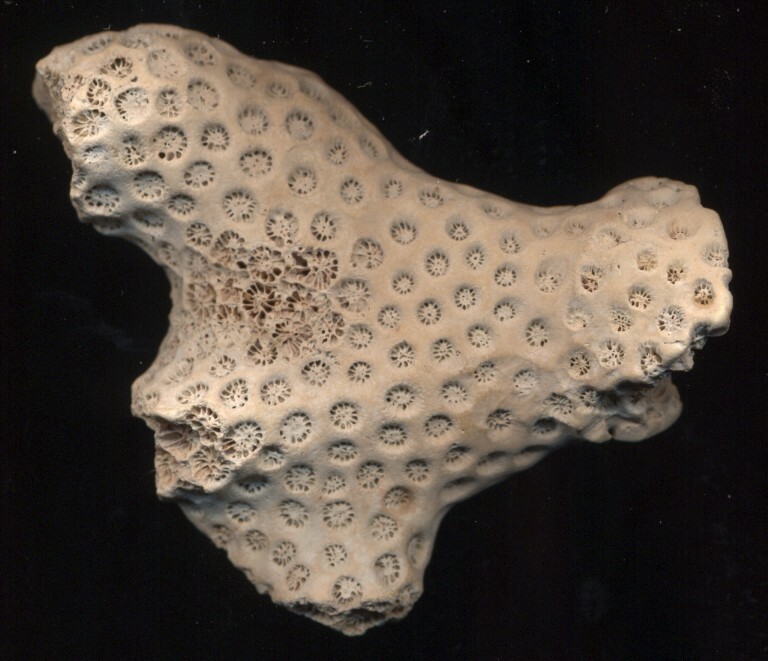 I know very little about fossil corals but it is certainly interesting to speculate. Any thoughts? Might very well be coral. Could the marks also be the result rock-burrowing marine species? There are several existing species, such as some molluscs, sea urchins and worms, that scrape out holes in rocks.